Chris Harvey’s practice concentrates on products liability, environmental and commercial litigation. 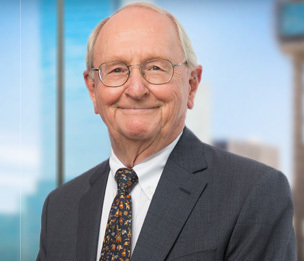 An active lawyer for over 40 years, Mr. Harvey has tried a wide variety of cases ranging from motion picture antitrust cases to First Amendment cases to complex product liability actions. He served as the head of the Products Liability Division at an AmLaw 200 firm for a number of years. He has experience in the trial of products liability cases over a wide variety of products involving catastrophic injuries. He was selected as a Fellow of the American College of Trial Lawyers in 1991, has served as Chairman of the Dallas County Grievance Committee, and has also served on the Board of Directors of the State Bar of Texas. Regional counsel for a major automobile manufacturer, supervising local counsel and lead counsel trying cases across the Southern United States. Defense of a global manufacturer of construction equipment in multiple cases involving catastrophic injury or death. Representation of manufacturers of a wide variety of products in serious property damage and various injury cases. Represented individuals of small and mid-size companies in a variety of commercial litigation matters involving allegations such as breach of contract, negligence, deceptive trade practices, fraud, negligent misrepresentation, breach of warranty, construction defects, libel, slander, and defamation, theft of trade secrets, breach of non-compete agreements and tortious interference with business relations. Representation of major manufacturer of oilfield equipment in toxic tort lawsuit brought by hundreds of neighbors following plant closing. Successful representation of nationwide waste disposal client in suit brought in the Rio Grande Valley by neighboring ranchers alleging ground water contamination from large landfill. Successful representation of nationwide construction company in suit brought by landowner following rupture of large gasoline transmission pipeline.